Neat! With auto-ssh it can make a reverse ssh connection to your amazon server for remote access! Pretty sure this all could’ve been done to be smaller. Cables aren’t really needed, and the full-size Pi could very well be a Zero. Unpack the switch, remove Ethernet connectors and power cables in favor of either FPCs (or some kind of smaller twisted pair), add a cheap USB-Ethernet (again, no connectors, and you might even omit Ethernet transformers on the Pi-switch path) and power the Pi from a 5V source on the board of the switch (there’s extremely likely to be one). Alternatively, use something router-chipset-based, like Onion Omega or VoCore – router chips have built-in switches. Something like a Black Swift is both extremely small, low-power and has everything that’s needed – in fact, you should be able to preserve the battery this way. This is a great setup for unsophisticated clients, but a good NAC setup or internal IDS could still see this. The RPi would still show up as a separate MAC on that switchport, and have its own IP that can be tracked down. How could a pentester make it even more stealthy on the wire? Black Swift looks interesting, as it does have two 100Mbps Ethernet ports (less the magnetics), but that in itself would be a giveaway if the system is expecting a GbE connection to the endpoint. the MicroTik hEX might do if its not too bulky. https://mikrotik.com/product/RB750Gr3 RPis are out, even the 3B+, as they don’t have enough (or fast enough) gigabit ethernet.. Omega and VoCore are also only 10/100Mbps. First; I haven’t seen any NAC or IDS paying much attention to speed or duplex (has anyone else?) I would think its a great way to get a buttload of false hits any time someone kinked a cable, used the wrong/old cat cable, booted to PXE, etc. Second; Remember when people ran entire routers with hundreds of connections from commodity 486 hardware? Pepperidge Farm Remembers. You don’t need a lot of horse power if your not doing full stateful packet inspection. Just clone the MAC of the endpoint and NAT it from the device. No fancy filtering or intensive processing. The device is free to use the endpoint MAC on the wider network and traffic bound for the original endpoint is none the wiser. Third; I’m terrible with off-by-one errors. I’ve been searching really REALLY hard for a small SBC with dual GbE, for exactly this purpose. They are incredibly hard to come by. Probably the best I have found so far is the EspressoBin, FRDM-LS1012A, GrapeBoard (https://www.grapeboard.com/) which is currently unobtainium, or things like the Up Squared, which are pricey. Somewhat larger would be the RMB33G (not yet available), which has expansion for WiFi cards and modems, etc. And then as a final option, I also found a mini PCI-E to dual GbE adapter, which can be combined with the SBC of your choice (with mPCIE, obviously). Why not a board with a single NIC and a small switch with VLAN setup between ports? SOHO routers are essentially this. Mirror the LAN side ports and you’ve got no leakage of the SBC MAC. I had been thinking, to be really sneaky, you’d have to drop link on one port when the cable on the other is pulled. I suppose you could do that with physical switches that depower the switch hardware until both cables are plugged in.. If I saw something like that in a server room I’d schedule some downtime for whatever was plugged into it and swap it out for a proper UPS solution. That thing would burn up in a minute. that’s why they said “in an office”, not even your super duper powers of observation would notice this thing in cubicle #43 behind the filing cabinet with the “I don’t like mondays” poster on it, and can you please come back when you find the proper form to request temporary downtime on the little fan that’s plugged into it. My coffee must be weak this morning. Why is an Ethernet switch needed to “allow the Pi to access the network”? Why not just connect the Pi directly to the network being tested? The two RJ-45 ports on the UPS were originally a simple surge protector. The same computer that gets its power from the UPS would also route its ethernet through the UPS to the network jack on the wall. The design here is adding an additional endpoint to that, so the network wall jack would be serving both the unsuspecting endpoint (aka desktop) and the RPi running Kali. Hence, it needs a switch. Totally did not think of that part of the illusion – thanks for waking me up! Cheap, work, don’t last. APC better. Most UPS devices include a USB interface. 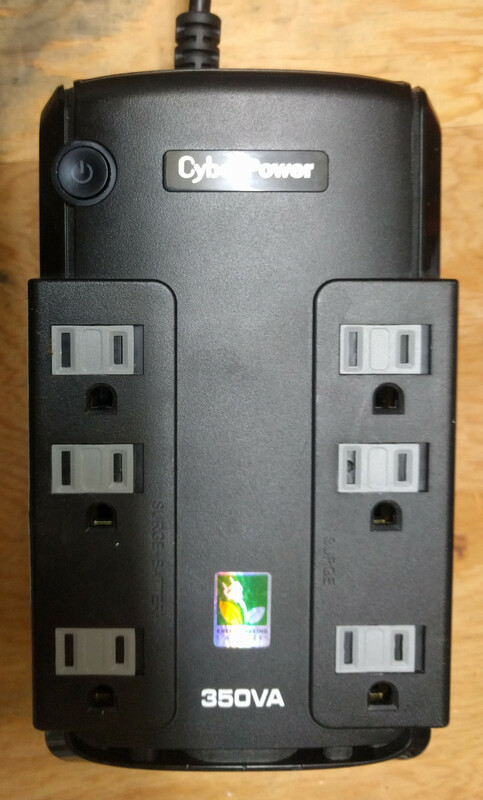 This allows it to notify the connected PC when power is lost so that it can be shut down gracefully when power levels are critical. Seems like a logical next step for this already impressive build. It would actually be kind of nice to be able to buy a computer with built in UPS and power strip. You’d never have to shut it down, you could transport it or even ship it while Linux runs the whole time. That’s how google built out its server farm. Each motherboard had its own custom UPS to prevent hiccups. I think it’s called a Laptop. You can stream a *lot* of data out of an LED. Blink it fast enough and it looks solid on to the human eye. Last year Ben-Gurion University did a demo of hard drive light to drone out a window.